Oxindole (2-indolone) is an aromatic heterocyclic organic compound. It has a bicyclic structure, consisting of a six-membered benzene ring fused to a five-membered nitrogen-containing ring. Oxindole is a modified indoline with a substituted carbonyl at the second position of the 5-member indoline ring. 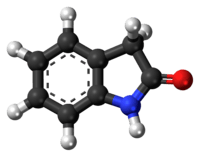 Oxindole is a tryptophan derivative and in human biology is formed by gut bacteria ("normal flora"). It is normally metabolized and detoxified from the body by the liver. In excess, it can cause sedation, muscle weakness, hypotension, and coma. Patients with hepatic encephalopathy have been recorded to have elevated serum oxindole levels. ↑ Riggio, Oliviero; Mannaioni, Guido; Ridola, Lorenzo; Angeloni, Stefania; Merli, Manuela; Carlà, Vincenzo; Salvatori, Filippo Maria; Moroni, Flavio (2 February 2010). "Peripheral and Splanchnic Indole and Oxindole Levels in Cirrhotic Patients: A Study on the Pathophysiology of Hepatic Encephalopathy". The American Journal of Gastroenterology. 105 (6): 1374–1381. doi:10.1038/ajg.2009.738.